Event of the day: A CHANCE TO MEET HANS VON RITTERN AND BUY SOME PHOTOS! Photos of the day: STOP BY AND SEE AND BUY SOME OF MY PHOTOS: You have two chances in the next two weeks. 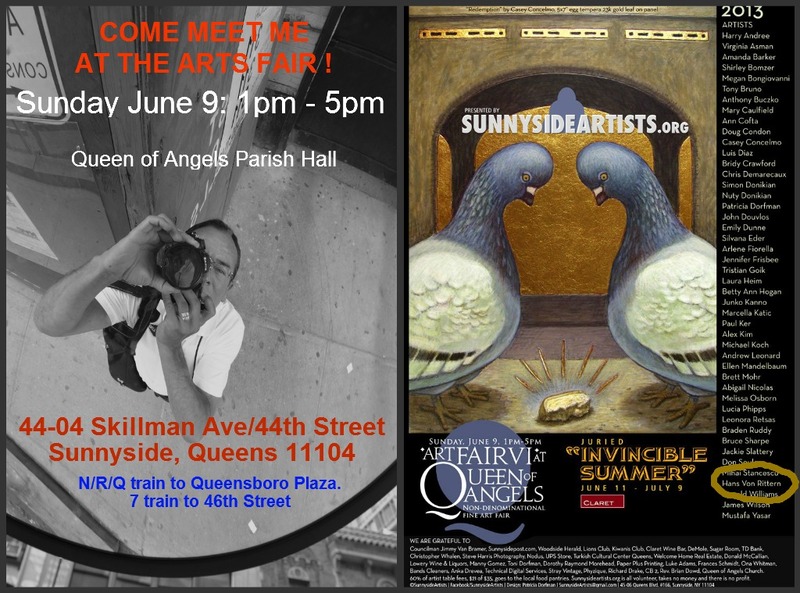 This Sunday, June 9th, is the “Invincible Summer” Art Fair at Queen of Angels Parish Hall, 44-04 Skillman Ave, corner 44th Street, 2 blocks from subway, phone 718-392-0011. I’ll be selling some of my photos from 1pm – 5pm. Photos starting as low as $20 and $25 ! MORE GREAT NEWS! I will have my own exhibit of 12-14 of my works at The Brogue Restaurant and Bar on 4910 Skillman Avenue (between 49/50th Streets) here in my hood Sunnyside. The reception party is tentatively scheduled for Friday June 14th. Please come all! This is the first time I am having an exhibit of my own! So come to both occasions but definitely come to the reception tentatively scheduled June 14th.! THE OLD ROCKERS: Old rockers never die they just get played out. There is so much going on here. I am passing by a disco concert on 46th Street/Queens Blvd. 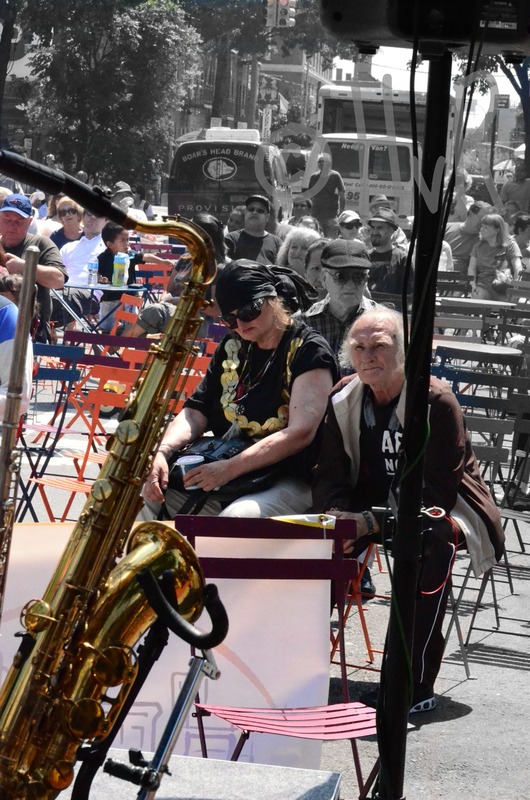 in Sunnyside, Queens yesterday, and I see these two faded rockers sitting in the front. She grabbed my attention first. In the glaring heat, she is wearing all black. The earrings are gold inverted crosses. Her t-shirt is the best – it has a big metallic gold chain (from the hood) printed on it. The sunglasses are pitch black Dolce Gabbana. But . . . she can’t keep awake to the blaring sounds of “Disco Inferno”. Her husband (?) is wearing the 2012 equivalent of a 1970’s leisure suit: a brown colored jogging suit. Any color is permissible in jogging suits, but brown = leisure suit. On the shoulders of his jacket are hanger impressions from the jacket having hung in the closet too long. 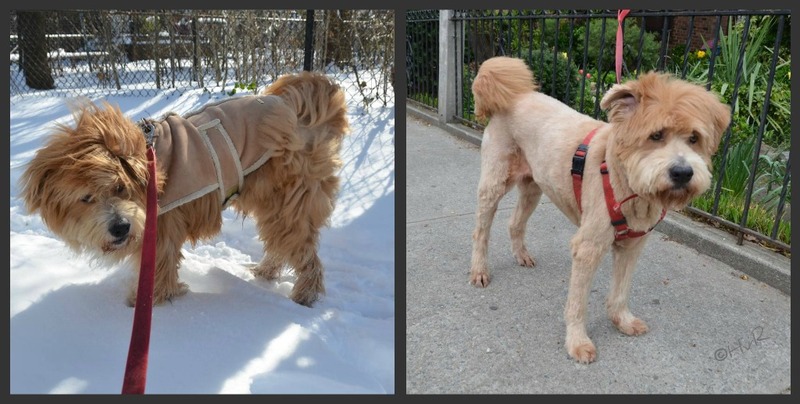 He has a long pony tail that has many shades of color no longer on his head. He loving ‘Disco Inferno’, nudges her enthusiastically, she just nods off . . .